Is a neighborhood matching program a good idea? An article in today’s Austin American-Statesman reports the City is considering a proposal that would have neighborhoods share in the cost of neighborhood projects. Some people are against the idea. They argue that is why we pay taxes. Read “Proposal: City, residents could team up on area projects. A ‘matching program’ for sidewalk work, speed bumps would stretch city dollars, officials say,” by Marty Toohey and leave a comment to this post (click on comment link below) on what you think about the idea. 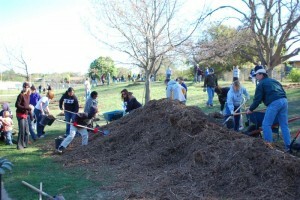 Allandale residents had some experience with this approach with the Northwest Park tree planting project that volunteers participated in the Spring. I can see this being positive for some neighborhoods, but I’ve a feeling that neighborhoods that couldn’t afford to participate would feel left out. Judging from the turnout at the Northwest Park tree planting in the Spring, people are willing to show up and help out with such projects. All that it takes, according to the proposal, is volunteer labor from residents and the city will provide management and materials. Allandale has shown they are willing to support neighborhood projects like the NW Park tree planting and the NW Park clean-ups. I know my neighbors would be game for trying a speed bump project! Let us know when to sign up. I can see the logic in the City wanting each neighborhood to share some of the cost of certain projects within any given neighborhood. That would make all neighborhoods more alert and selective about how tax money is spent within their boundaries. We have a tendency to be in favor of, and less concerned about the cost of, a project in our neighborhood that is almost fully paid for by taxpayers in other neighborhoods. A recent example that comes to mind was the Frankencurb project that was installed and then and torn out a couple years later on popular demand. That was over three quarters of a million taxpayer dollars down the drain. I’m sure many taxpayers in south Austin are unaware of that waste that took place in Allandale at their expense, or that such waste is ongoing. Currently Allandale is replacing earlier park benches along a sidewalk with benches that are located instead on an expensive wood and steel deck. Its like an elegant fishing pier but with no water under it and no shade trees over it. The pier probably is costing $5,000 to $10,000, maybe more. Taxpayers in other parts of town probably don’t even know they are buying it for us. I think it would be money better spent if the pier / deck were located nearby over the pond in Northwest Park where visitors from other parts of town could find and enjoy what they are paying for. But instead it is obscurely and non-strategically located along a sidewalk along the Great Northern holding pond for flood water which is not exactly a destination spot for fellow Austinites. For the last 20 years benches along that sidewalk have been good enough for us to stop and rest our legs while we watch our dogs run free. The benches were located under the shade of wonderful crepe myrtle trees. The shade trees are now a memory, replaced by an expensive open deck in the hot sun. So please explain to me once again exactly how Austin is dedicated to spending wisely or to “going green”? I shudder to think how many projects like this are going on in other parts of town that residents of our neighborhood are unknowingly supporting with their tax dollars. I know North Shoal Creek can’t wait to use their $35,000 and hand it over to the city for sidewalk repairs and traffic calming. But really, it irks me that the reason the city has not allowed neighborhoods to use their money in the past was because of the possibility that there would be an appearance that certain parts of town were being favored with projects while other ‘poorer’ parts of town went without. In reality, East Austin gets a great deal of largesse from the city for all kinds of projects. I understand their history, the Holly Power Plant issue, the tank farms, etc. But at this point in time, there are developers knocking on their doors offering them money for those pier and beam type ramshackle houses that would knock your socks off. There is money still left for them to apply for a grant to fix up their houses so they can still live there if they want to. And there are tax abatements for people who have lived over there for a certain period of time to make up for ‘gentrification’. And they have lots of parks, libraries, senior citizen centers, traffic calming. The city just received stimulus funds in the amount of $350,000 for sidewalks and infrastructure improvements over there. And a faction over there was howling over some Holly Power Plant set aside money being used to develop another park along the trail, which is right in their back yards. Some of the prettiest parts of the downtown trail are east of I35 right in their neighborhood. Enough already. The city has not used up the sidewalk repair bond money from 2006 yet. According to my latest inquiry with Public Works, the sidewalk repair crew was taken off that duty for the last four months to work on some kind of project for the downtown area. We are told to just wait in line. And I think if we look long and hard enough, I bet somebody could dredge up some traffic calming money that did not get used in a previous year. I like this idea in theory but am concerned with the caveat that “funds will be spread evenly across the City.” The problem is that the City’s problems are not distributed evenly across the City. The City two years ago rezoned hundreds of acres in North Central Austin to allow multi-family housing, in an environment utterly inhospitable to people. The scale of the problem is enormous, and serious investment is required. The risk is that this program will be deemed “the solution” to making areas along Burnet or Anderson “pedestrian-friendly.” It’s not nearly enough investment, and the burden shouldn’t be only on existing neighborhood associations whose core interests are in existing residential areas, not the commercial areas. We need to hear City Council members make explicit the assumption that transit corridors require additional investment and zoning changes far beyond this single program.